Heat oven to 450ºF. Remove 1 crust from pouch. 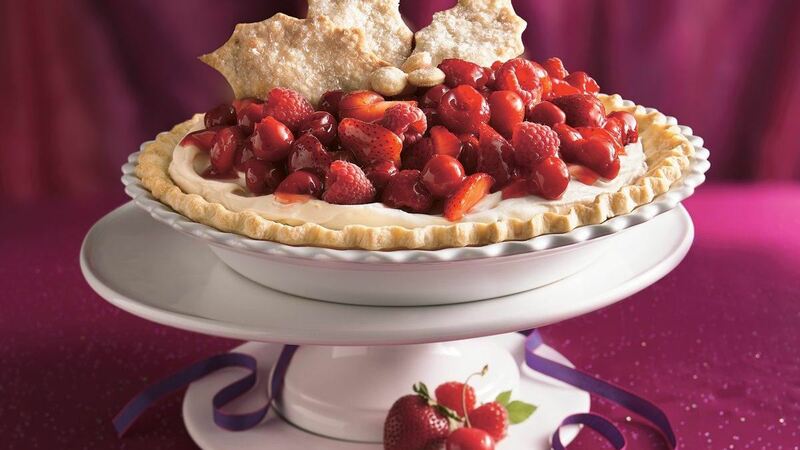 Make pie crust as directed on box for One-Crust Baked Shell using 10-inch glass pie plate. Bake 9 to 11 minutes or until golden brown. Cool completely, about 30 minutes. Meanwhile, to make cheesecake decorations, grease baking sheet with shortening or nonstick cooking spray, or line with parchment paper. Remove remaining crust from pouch; unroll onto baking sheet. Cut crust into large holly leaves using cookie cutter. Cut small circles for holly berries. Place on baking sheet; sprinkle with coarse sugar. Bake decorations 8 to 10 minutes or until light golden brown. Carefully remove from baking sheet to cooling rack. Cool completely, about 15 minutes. In large bowl, beat cream cheese, granulated sugar, the lemon juice and vanilla with electric mixer on medium speed until fluffy. Fold in whipped topping until well blended. Spread 2 cups cream cheese mixture in cooled baked shell. Gently spoon and spread preserves over mixture. Spread with remaining cream cheese mixture. In medium bowl, mix pie filling, 2 1/2 cups of the strawberries and 1/2 cup of the raspberries. Spoon over cream cheese mixture. Sprinkle with remaining strawberries and raspberries. Refrigerate at least 4 hours or until set. Just before serving, arrange some of the holly leaves and berries on cheesecake. Serve individual slices with additional holly leaves and berries. Store in refrigerator.